In the final two weeks before a deadly asteroid ploughs into the planet Detective Hank Palace has one final case to solve – to track down his wayward sister, Nico, who belongs to a radical group that believes that they know a way to avert disaster. Hank sets off on a journey from Concord, Massachusetts to Rotary, Ohio with his dog Houdini and the resourceful ex-con, Cortez, passing through deserted and barricaded towns, encountering souls nervously protecting what little they’ve managed to horde. Arriving at the last known place Nico was sighted, an abandoned police station, Hank becomes suspicious that it’s the scene of a murderous crime. His suspicions are confirmed when he discovers a young woman barely alive after her throat had been cut. Despite there being only days left until armageddon Hank is unable to stop being a policeman, rescuing the woman and trying to solve the mystery of who attacked her and left her for dead whilst also trying to locate his sister. 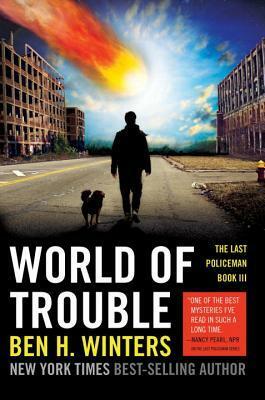 World of Trouble is the final book in the Last Policeman trilogy. The countdown to a massive asteroid hitting Earth is very much in its last phase, with no hope of the disaster being averted. The conclusion to the book is then very much assured. The intriguing hook is how rookie Detective Hank Palace decides to spend his final two weeks, continuing to act as a policeman while the rest of world either descends into chaos or tries to prepare themselves for the impending disaster. Palace’s quest is to try and find his wayward sister and solve a couple of puzzles. There is a lot to like about this series and the final book, most notably the character of Hank Palace, a thoroughly decent man who is committed to the premise of law and order. Winter constructs a plausible pre-apocalypse landscape and to his credit, rather than ramping the story up into an explosive ending, he maintains a realist narrative and sticks to a police procedural format. The result is an engaging, thoughtful and somewhat sombre tale that I found a thoroughly enjoyable read. There were, however, a couple of bits that I found didn’t quite add up with regards to the puzzles. 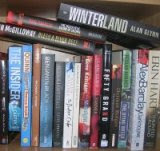 Interestingly, Winters does leave the story slightly open-ended with the possibility of Palace continuing his adventures post-apocalypse and I hope he might persist with the series, much as Adrian McKinty did with his Sean Duffy trilogy.